Rugged all steel designs, for the best combination of lightweight and longevity. 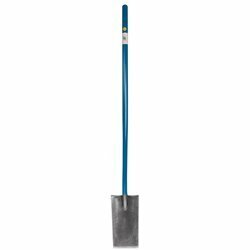 These professional grade spades feature smooth, zinc-plated rust-resistant finishes (no rivets or sharp edges!) Aircraft quality alloy tubing construction turned steps, and heavy gauge steel blades. 13" blade; tapers from 7 3/4" to 6 1/2". weight is 6 lbs.